A Best wooden easel for the oil and acrylic canvas painter. Solid oak easel. 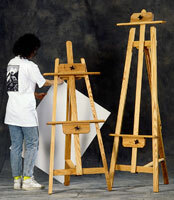 The quality wooden easel is a sturdy tri–mast A–frame design is durable and folds flat for easy storage. "A" easels feature non–skid rubber feet for stability. This is a quality wooden easel.